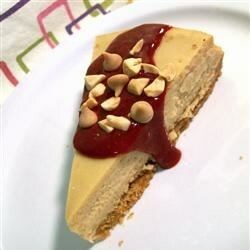 "As the name suggests, this is a peanut butter cheesecake with your favorite flavor of jelly on top." Preheat oven to 325 degrees F (165 degrees C). In a medium bowl, combine graham cracker crumbs, 3 tablespoons sugar and melted butter. Mix well and press into the bottom of a 9 inch springform pan. Bake in preheated oven for 10 minutes. Remove from oven and allow to cool. In a large bowl, beat cream cheese, sugar, peanut butter and flour together until smooth. Mix in eggs one at a time. Blend in milk. Pour batter into prepared crust. Bake in preheated oven for 10 minutes. Reduce temperature to 250 degrees F (120 degrees C) and continue to bake for 40 minutes. Let cool to room temperature, then refrigerate for at least 4 hours before removing from pan. Stir jelly until smooth and drizzle over cake in a lattice design. good, I omitted the jelly, increased the PB to 1/2 cup, added chopped up peanut butter cups and a layer of fudge to the bottom and the top. This was my first time making a cheesecake and everyone loved it! We topped ours with fresh fruit. I made this cheesecake for Thanksgiving desert and it was a huge hit. I eliminated the jelly and drizzled hot fudge ice cream topping over it. Excellent! This is so good! I omitted the jelly because I was only interested in the PB. I added PB chips but I wouldn't recommend it, it's better without.